Orange Village has a new ordinance #2018-47 effective January 2, 2019, which will allow you to add your property to a “Do Not Knock Registry” in order to protect your home from unwanted solicitation. The list will be kept by the Orange Village Police Department and made available to anyone who registers with the police department to go door to door. This list will advise the person of the properties who do not wish to receive uninvited guests, thus stopping them prior to entering onto your property. It will be a violation of the law for the person to knock on the door or ring the doorbell of any property that is registered on the “Do Not Knock Registry” or that has a sign which reads “Canvassers and Peddlers Prohibited. Click here for complete information. 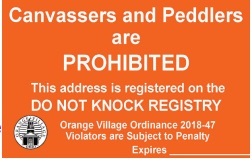 Orange Village will be supplying “Canvassers and Peddlers Prohibited” stickers to properties that are on the registry. This sticker will be another means for the solicitor to know not to go on your property. Click here to add your name to the Do Not Knock list If you have questions regarding this matter please call the Orange Village Police Department at (440) 498-4401.